Maxcoin will use the Kimoto Gravity Well (KGW) to regulate the difficulty. From what I could find about the KGW, it retargets after every block and adjusts very quickly, e.g. when multipools add and retract mining power to a smaller coin's network. Apparently, KGW = 1 + (0.7084 * (PastBlocksMass/144)^(-1.228)) (-> Introductory post by Kimoto) describes how to calculate the Kimoto Gravity Well. On another source, it was stated that "KGW is applied if the hash rate is high, and 1/KGW when the hash rate is low" (-> Post on Catcoin's adoption of KGW). What does PastBlocksMass refer to? Does KGW only rely on the time required to find the previous block? Why/How does the above formula produce the described fast adaptation of the difficulty? The explanations on the web are all very vague and mystical, on purpose maybe. Here is my take in simple words, just reading the megacoin source code from the above comment. The goal is to have a more adaptive way of adjusting the difficulty instead of just averaging the last 2016 blocks like bitcoin. This is needed because of multipools which might switch the coin they are mining, and a sudden change in hashrate can occur (both increasing or decreasing). Especially when a multipool switches away you get stuck too long with a too high difficulty. The algo loops backwards through the blocks, starting from the current one. The PastBlocksMass is just the number of blocks, so it starts at one and increases in each loop. In each loop an adjustment factor is computed, which is the target block time divided by the actual block time, in a cumulative fashion, so at loop 10 we would have the 25 minutes target time divided by the time it actually took to compute the last ten blocks. When the hashrate increases, we get shorter times and an adjustment factor greater than one and vice versa. The script produces a figure like this . 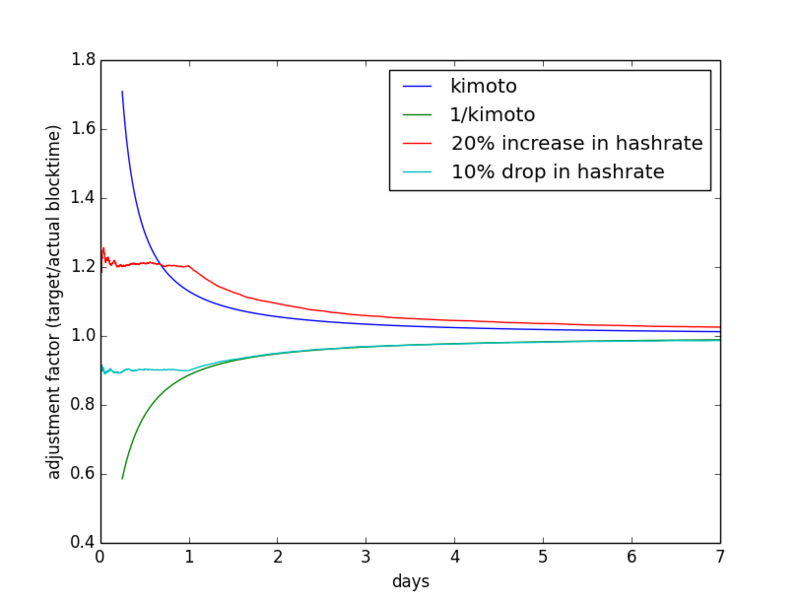 It shows two constructed examples when the hashrate increases and when it drops for one day. Best is to play with different settings for a while to get a feel for what is going on. You see that the lines cross through the Kimoto formula at some point. This is when the algo exits and uses this adjustment factor to compute a new target/difficulty. For large adjustment factors this happens earlier than for the ones closer to one. This is to have a quick adaptation if the hashrate changes a lot, and a slower one if not - then we want a longer period to get a better average. The parameters of the Kimoto formula are adjusted in such a way that one roughly adjusts in one day to a 10% change and in seven days to a 1.2% change. A minimum of 144 blocks determine the new difficulty and at most 4032 (0.25 days or 7 days for a 2.5 minute blocktime). Summary: the Kimoto gravity well algo has a fancy name and determines the number of blocks which contribute to the evaluation of the new difficulty. It gives fewer blocks for high hashrate changes and is therefore more adaptive. Not the answer you're looking for? Browse other questions tagged difficulty algorithms maxcoin or ask your own question. Attack the network by temporarily adding hash power? Lower confirmation time schemes: any requirement between confirmation time and the probability to find a block during that confirmation time? How does blockchaininfo find out the difficulty? How can one estimate the difficulty change? Is the target the source of the difficulty?